The Diageo Special Releases are a bit like Christmas Day…although much better! The annual release whips up an unprecedented level of excitement within whisky circles, as Diageo groups together its limited-edition whiskies and launches then all at the same time. In fact, launching them in the autumn my just be a ploy to get them on our Christmas lists. 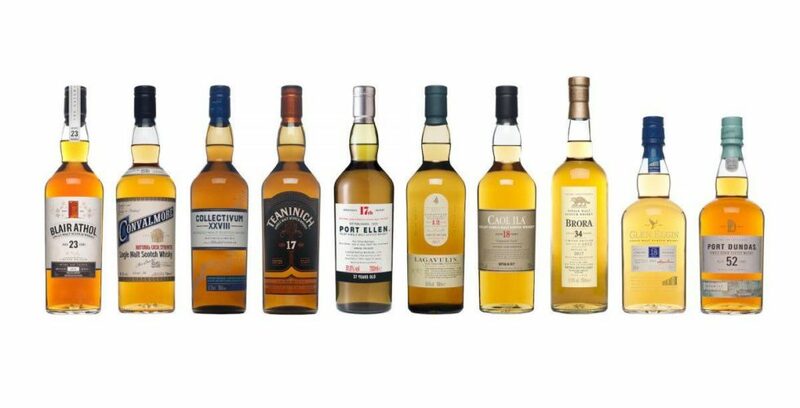 This year’s ten-strong collection features four malts from closed distilleries and, for the very first time, a Blended Malt Scotch Whisky containing whisky from all 28 of Diageo’s single malt distilleries. With ages from 12 to 52 years old and prices from £90 right up to £2,625, it’s fair to say there was something for everyone on the night. As I did in 2015, I’ve attempted to order/rank these whiskies. Five today – and my five favourites later in the week. This once in a lifetime blend brings together whiskies from all of Diageo’s 28 single malt distilleries. From Cardhu and Dufftown, to Glen Spey and Oban, they’re all here. Which is possibly why this dram didn’t gel with me. I was looking for the individual malts and trying to identify them, as I found the dram to be an interesting experiment, rather than a great success. Bar the Diageo’s Flora and Fauna release, you don’t see much Teaninich around; which makes it even more astounding that the distillery is celebrating its 200th birthday this year. I found this expression to be quite dry to start with, but then warmer fruits started to flow through. There’s also a slightly spicy edge of cinnamon and nutmeg, with toffee and vanilla fudge. The palate was even richer than the nose suggested, with a creamy smoothness followed by a citrus burst, and a good dose of oak from the wood. Lagavulin is well known to whisky fans across the globe and this release marks the fifteenth time special 12 year old stocks have been released from the warehouse. You might think that younger means less characterful but this is full of complexity – that fresh and clean nose, mixed with the smoke of a developing fire. There’s a real saltiness to this but the lightness also allows fresh apples and a tiny hint of banana to come through. The palate also balances these contrasts well – so much so, that I often find that the Lagavulin 12 is simply a Caol Ila in disguise. A great example of a Lagavulin 12 Year Old but I couldn’t quite find how this was different from previous releases. Here we have the original Clynelish distillery – Brora. When a new Clynelish distillery opened in 1967-68, Brora reopened the following year, producing heavily peated ‘Islay style’ malts for blending. Unfortunately, this also fell silent in 1983. Would you get bored if I compared another whisky to Clynelish? Well, sorry, but the history demands and that distinctive waxiness was there. But unlike Clynelish, there a wisp of smoke on the nose, along with plenty of tropical fruits – pineapple and mango this time round. It’s also got a slight maritime edge about it. That waxiness continues on the palate, sat alongside apples and dark chocolate, followed by the sharpness of chili and Szechuan pepper. A cracking dram…but it couldn’t quite crack my top five. Five whiskies in the Diageo Special Releases done – five to go. Check back later in the week to find out what were my favourite drams from the collection.